Posted on Tue, May 1, 2012 : 11:36 a.m. Apparently nothing can stop Austin Hatch. Ten months after surviving a plane crash that killed his father and stepmother, Hatch -- a Michigan basketball commit -- told the Detroit Free Press on Monday that he intends on playing college basketball with the Wolverines in 2013. "I'm still going on a full basketball scholarship," Hatch told the Free Press. "I'll still be on the team and all of that and go to practice and everything. But I just don't know if I'll be quite as good as I was before. But I still have over a year until then, so a lot can happen." 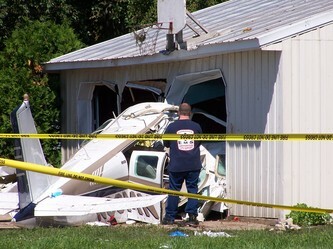 Austin Hatch survived this plane crash in Charlevoix that killed his father and stepmother. Ten months later, he says he's still planning to join the Michigan basketball program in 2013. In an extensive phone interview with the Free Press, Hatch spoke of the trials he's gone through since the crash took place last June. From losing his family to rehabbing in the hospital, all the while keeping his dream of a college basketball career alive. "My speech is a little bit slower because I had a traumatic brain injury," he said. "In my mind, that's the worst kind of injury because the brain is every bit as valuable as every other organ. "I still have all the intelligence, it just takes me a little more work to access it. All the knowledge is still in my brain, but it's just kind of hiding. It's taken every bit of the last 10 months to learn it." Wed, May 2, 2012 : 9:27 p.m. Pretty cool. I hope he succeeds! Wed, May 2, 2012 : 12:13 a.m.
God Bless, Austin. Like Calvert says, you are a true warrior. All of Wolverine Nation is behind you and you will make all of us proud when you wear the maize and blue to represent our university. Tue, May 1, 2012 : 8:44 p.m.
My prayers are with you Austin! Stay encouraged you are some kind of warrior! !